Home Tips & Tricks	Track Lost Phone: How to track lost mobile phone? Keeping a Smartphone is a trendy thing nowadays. People use to buy latest smartphones equipped with all the features like a good camera, a lot of internal memory, extra ram for a flawless speed. Smartphone outraged all other gadgets which we people were using a few days back like wrist watches, play station, iPad etc. We can do all these things on our smartphones nowadays. We play games, listen to music, and watch movies, sending emails, video chat, internet banking and lot more stuff with our smartphones. Social media sites like Facebook, Twitter, and What’s App is the other important reason to stick to our smartphones. 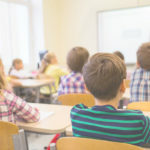 We can connect with the whole world with this small device. We can use our phone as our fitness manager also. Track lost phone when we were on a road trip, phone GPS system helps us to find our path. From morning till evening, our smartphone is our best companion. The smartphone is an inseparable part of our life. We keep and store each and every memorable moment of our life in these phones. We use to take pictures of every moment, we enjoy. Even when we became parents we capture our little new born each and every expression. We store these precious memories in this device. But when we lose this device, it’s like losing our best friend. Losing a smartphone full of our photographs, personal messages, and emails is a moment full of stress and anxiety. For a moment, everything stops and we went into a complete silence. Losing a smartphone is so upsetting for some of us more than losing a wedding ring. This attachment to our smartphone is because of the convenience it provides to us. The moment we realize that we lost our phone somewhere or when we couldn’t find after one or two attempts, then we run from pillar to post to search out for this device. We ring it several times, try to find it out everywhere but luck will not favor us always. After the complete realization that the new owner makes up his mind to not give this gadget to us, the first thing that came up into our mind is police complaint. Now the time is come to understand the reality of our country. Losing our smartphone is a very painful and stressful moment for us and we are expecting the same from police. But for police, it is a routine thing and maybe not so important work for them. In most of the cases, they are not interested in your story because they have many more urgent works than searching your smartphone. And if you are a common man things are going to be more difficult for you. In most of the cases, policemen never search your smartphone. They do the formality of lodging a FIR and give you a copy of the same. Mostly, Indian police do not take any kind of a pain to search for your expensive Smartphone phone unless and until you have an approach of a renowned person of your locality. Once you have done with DDR/FIR, now you need to approach your service provider along with a copy of DDR/FIR to get back your same previous contact number. Your service provider can only give you a new sim of your lost number on the basis of this FIR only and they can’t track lost phone with IMEI number. In India track lost phone with IMEI number is restricted to police only, no one else can track lost phone using IMEI number. And if one who got your lost phone and changed the phone sim cards, you can’t track lost phone by yourself, even not with any app or web service. 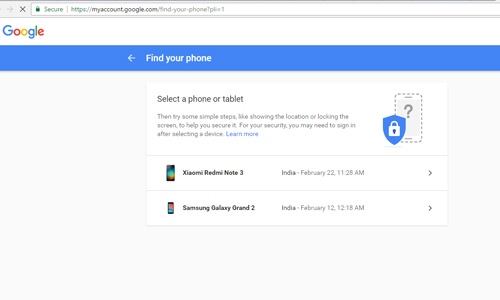 But, here we will discuss a trick where we can track lost phone without using IMEI number. But for this our phone must be connected to the internet. There are few different ways to locate, ring, lock and unlock your lost phone remotely. We can also remotely wipe out all our personal data stored on the phone. Let’s discuss few ways to track lost phone / smartphone. When you have lost your mobile phone, first of all, recall the Google account, using which you have logged-in your mobile android device. Then open Google chrome browser on your laptop or desktop. 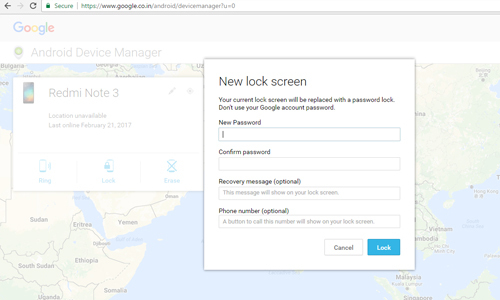 After that type in Android Device Manager in the search bar and you will see a screen shown below. Then click on the very first option shown in the figure above. 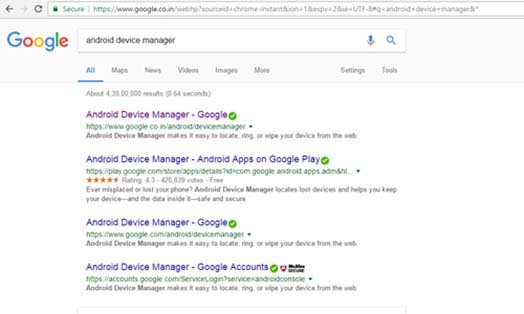 The image above showing a mobile device which is being connected to your android mobile device. Options in blue color are the available options which we can use. 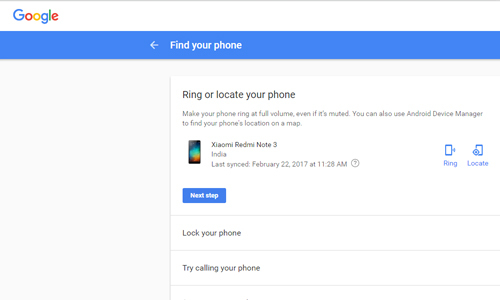 This option will ring the lost phone from a remote location, which will ring your mobile phone in its maximum available ringing volume. When you click on the Ring option you will see a screen as shown below. Click on the Ring Button in blue color as shown in above image. It will start ringing your phone for 5 minutes on full ringing volume. Using this option we can lock our android device from a remote location. When you click on the lock option, you will see a screen as shown in the image below. Now you need to fill the above showing form and click on blue lock button. This will lock the screen of your phone and display a recovery message and phone number. 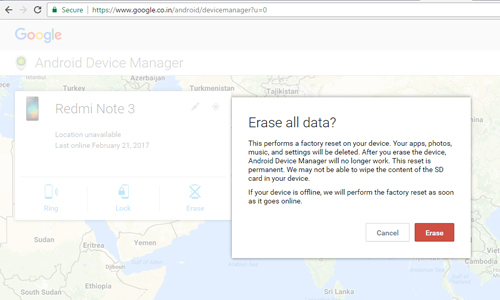 Using this option we can erase data remotely which has stored in our android device. When you click on Erase option it will erase all the stored data on it. No there would be no threat of misusing your personal data. As you click on the Erase red button, it will wash out all the data and it will reset the phone to factory reset condition. The main negative thing about this option is, it can only be performed on Android operating system devices. It can’t be performed on IOS or another operating system of mobile phones. So, let’s discuss another available option which can be performed on any mobile phone operating system, it can be android or IOS or any other. But, you must be logged-in to your Google account on your Smartphone. 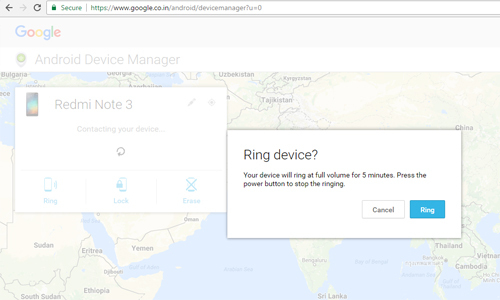 This is another trick to track lost phone which is regularly synchronized with your Google account. You first need to login into your Google account, then open search bar. And start type “Find my phone”. And click on the search button. You will see the screen as below. 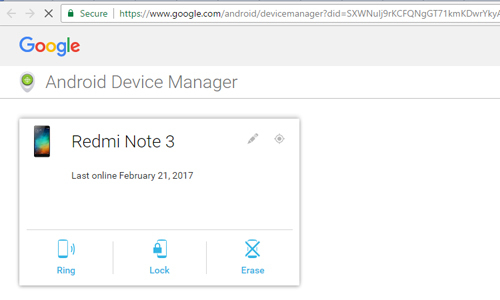 The above image is showing a phone which is connected to the logged-in Google account. Now follow the steps below listed below to safeguard your mobile phone from being misused. Click on the link showing just under this image it will redirect you to a screen showing in below image. Now you have to select the phone which you have lost, it will redirect you to the login page to confirm your password. Then it will redirect you to the screen shown below. 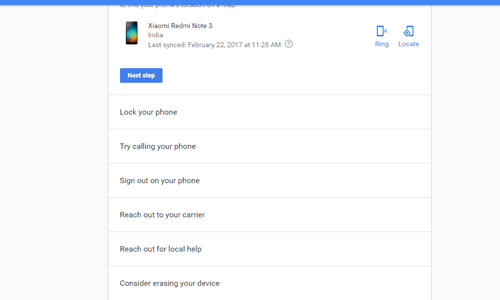 The image is showing the available options which you can do with your lost phone remotely. You can now use the available options to locate or find your phone. These options are same which offer you to ring, Lock, erase and other option which can help you to reach your lost phone. And these options can be performed on any mobile phone operating system. 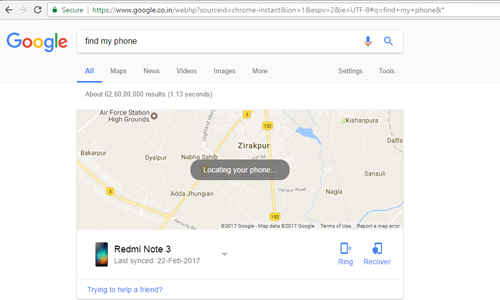 These are some tricks which you can perform yourself to track lost phone. 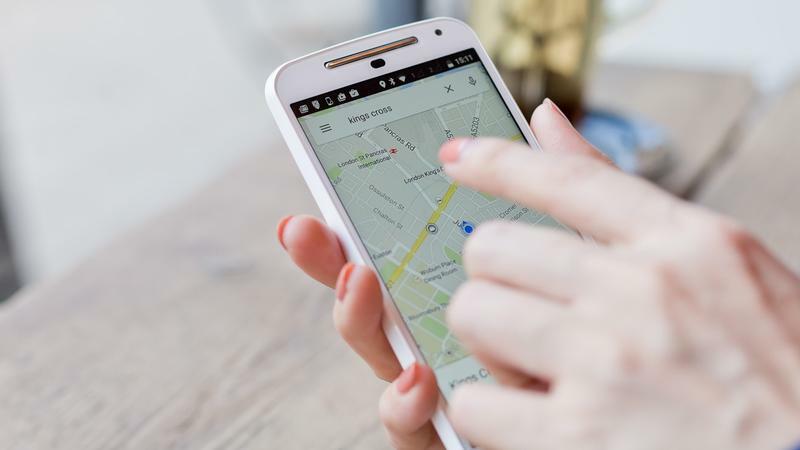 These tricks are helpful to track lost phone and know the location of your lost mobile phone and to erase your personal information from your phone. But these tricks can only be performed until your mobile phone has not been factory restored.